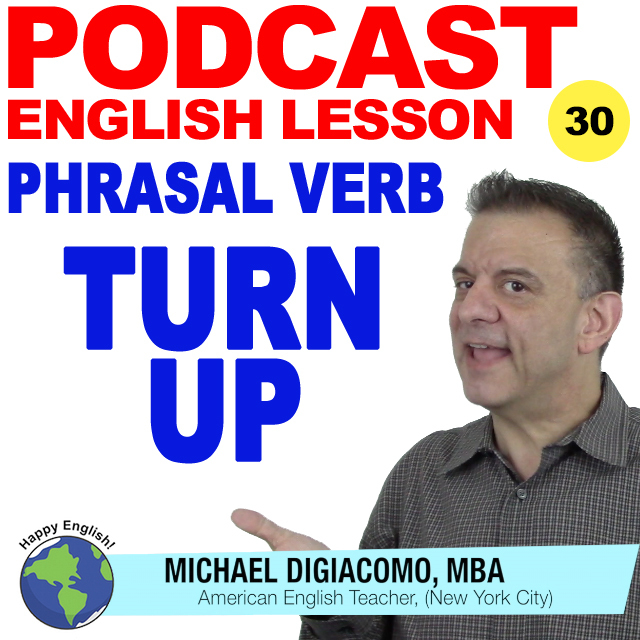 The phrasal verb turn up has a few different meanings and uses. Let’s learn this useful English vocabulary in today’s lesson. We use turn up to mean increase the volume or level. The opposite of turn up is turn down. Anything that has an up/down adjustment can be turned up or turned down. Turn up the radio. I love this song. If you turn up the gas on the stove, the water will boil faster. I asked him twice to turn down the air conditioner, but it’s still cold in this room. Turn up is also used to mean to arrive. Brad turned up late for work and the boss was really angry. I hope Jenny will come to the party. Everyone will be happy if she turns up. I waited for Jack for over an hour, but he never turned up. I wonder what happened. The police investigation turned up new clues about the murder. I hope my lost wallet turns up at the reception desk. Don’t worry about your cat. I am sure she will turn up soon.